New Kent’s Brody Smith (left) stares down the ball as Northampton’s Wayne Creed (right) looks to dribble by the Trojan defender. Some games aren’t meant to have winners or losers. However, a Friday night contest against the visiting Northampton Yellow Jackets and New Kent’s Trojans provided a beautiful display of defense. However, that pageantry turned into chaos for the hosts within the first four minutes of the second half. Two quick goals by the Yellow Jackets accompanied with a late stand sparked a 2-1 victory for Northampton over New Kent. Despite a frantic pace, New Kent squandered opportunities to score. The Trojans failed on a penalty kick and watched as Yellow Jackets goalie Gerardo Maldonado-Lopez stop shots and punt the ball back into New Kent territory to prevent additional attempts. The same could be said about New Kent keeper Logan Deters as he deflected three great shots in the first half to keep the game scoreless at the intermission break. But Northampton chinked the armor of the Trojans in the opening minutes of the second half. An inbound throw from Kevin Ortiz to Mariano Gaytan saw the Northampton forward use a header to bestow a lead to the visitors. Not long after that goal, Yellow Jacket Wayne Creed raced down the field and assisted Alvaro Huerta-Torres’ goal to add another point in the visitors’ score column. The hosts saw more attempts fall by the wayside before New Kent’s Alan Walker drew energy from the crowd’s chants. That motivation resulted in teammate David Hernandez finding the back of the net at the with 10:51 remaining for the Trojans first goal of the night. New Kent’s assertive attack pushed Northampton back on the defensive side of the field. 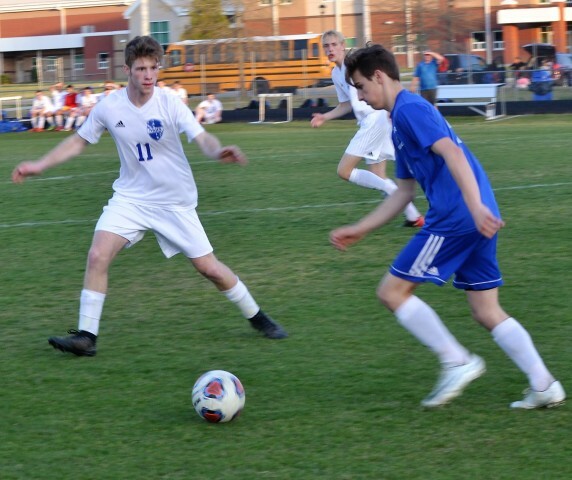 But the Trojans failed to capitalize on free kicks as time expired on the hosts and allowed the guests from the Eastern Shore to escape with the victory. After the contest, New Kent head coach Keith Grant looked exhausted as he spoke about the team’s missed chances. “I feel bad for the guys and I hate comebacks because it takes so much to do it, especially in a game like this,” he said. “After our penalty kick, things just didn’t go our way. New Kent drops their third consecutive contest, evening their record to 3-3 on the season.